You may want to be careful before you disdainfully toss away that good for nothing penny next time. A 1795 reeded-edge U.S. penny recently fetched $1.3 million at an auction. 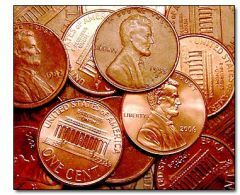 The coin made history as the first penny ever to rake in more than a million dollars, according to the Wall Street Journal (subscription required). Why such a high price? Apparently wealthy investors, anxious about a spiraling dollar and future inflation are bidding up prices for rare coins. They feel more secure about putting their money on these coins than investing in stocks and bonds. Clearly, the recession is not affecting the coin collectibles industry. Earlier this year a high-end collection of rare half dollars grabbed $1.1 million at an auction. "Things that are ordinary are not doing well," said John Albanese, founder of Certified Acceptance Corp. in a phone interview. "But the rare coins are one in a million. They are trophy coins and you don't see them everyday." Wealthy, sophisticated buyers don't mind the high bids because they know if they don't grab the coin when it's available, they may have to wait another 30 years for another chance, he said. So, if you have always wondered when's a good time to break open that piggy bank, this may be it. Who knows, maybe you'll find that rare penny and your ticket to the millionaire bracket.